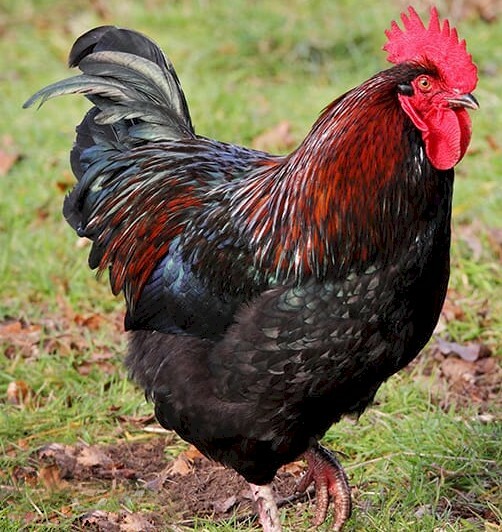 In the 1850s Asian chickens began to arrive in Europe, where they were at first known as "Shanghai" chickens. These were initially cross-bred among them, and only later developed into breeds such as the Brahma, the Cochin and the Croad Liangshan. From about 1865, some of these Shanghai chickens were cross-bred with local farmyard chickens in the area of Barneveld. Towards the end of the nineteenth century there may also have been some breeding with a type called Amerikaanse Nuthoenders which served as utility birds that showed some similarity to the American Wyandotte; it is not known what these birds were, or if they were really American. In about 1906 there may also have been some cross-breeding with British Buff Orpington stock. According to Hans Schippers, the greatest influence on the characteristics of the Barnevelder was from the Liangshan, which contributed hardiness, brown eggs, and good winter production. They were first used for birds shown at the agricultural exhibition held in The Hague in 1911. From about this time attempts were made to breed for consistent type and color. However, when the Dutch Poultry Club discussed whether to accept the Barnevelder as a new breed in 1919, it was found to be too variable. In 1921, a breeders' association was formed, and the first standard was drawn up. The breed was recognized in 1923. In 1921 Barnevelder chickens were exported to the United Kingdom to serve demand for brown eggs. At first they were very variable, with single-laced, double-laced, or mostly partridge plumage. Partridge and double-laced varieties were included in the British Poultry Standard; the double-laced became the principal variety. There may have been some cross-breeding with Indian Game stock.